Pumpjacks extract crude oil from oil fields. Each oil field can be covered by only one pumpjack at a fixed spot. The pumpjack will then output an amount of crude oil per cycle equal to 10 multiplied by the field's yield (e.g. 54 crude oil for 538% yield) per second. Without speed modules, one pumpjack cycle takes one second to complete. Extracting oil lowers the field's yield by 1% per 300 pumpjack cycles to a minimum of 20% of the initial yield or 2 oil per second, whichever is larger. They are limited to a maximum output of 100 crude oil per cycle, achieved by an oil field with more than 999% yield. However, such a high yield is fairly rare with standard world generator settings. Pumpjacks cannot be placed on a non-oilfield tile. Furthermore, the output pipe location is fixed relative to the pumpjack's orientation. If oil fields are depleted (to the minimum of 20%) speed modules are a good option to raise the pumpjacks output. With two speed module 3's the output doubles from 2 to 4 crude oil per second and even more when using additional beacons, plus another 0.5 oil per beacon per second. Output of unmodified oil field * [1 + (number of modules in pumpjack * bonus from module) + (number of beacons * distribution efficiency * (number of modules in each beacon * bonus from module))]. 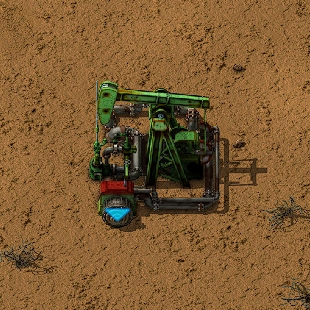 For 1 pumpjack on a depleted oil field with two level 3 speed modules and 6 beacons with each two level 3 speed modules: 2 * [1 + (2 * 0,5) + (6 * 0,5 * (2 * 0,5)) ] = 10 Crude oil per 1 second. Assuming that there will be always two speed 3 modules equipped in the pumpjack and beacons, the formula for 6 beacons can be shortened: 4 + 2 * (6 * 0, 5) = 10 crude oil per second. Pumpjacks can be turned on and off using the circuit network. They can also output the current oil mining rate. This page was last edited on 1 February 2019, at 06:48.